Water-pepper is not easily confused with other wild plants on this web site. Easily overlooked in damp places, wet mud, shallow lake margins and shaded places, Water-pepper is an erect, hairless annual which reaches to about 70cm tall. Its stems are graceful, arched, slender spikes of inconspicuous little pale pink flowers (3-4mm) which bloom from July to September. These little flowers can occasionally be greenish-white. 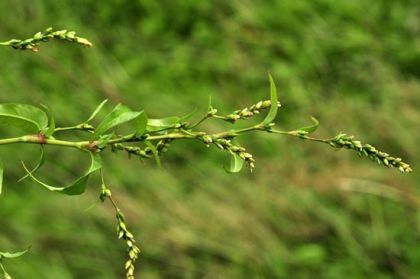 The leaves are alternate, lanceolate and untoothed, and at their base is an ochrea or papery sheath which is brown. This is a native plant, found in most parts of the country with the exception of the Centre. It belongs to the Polygonaceae family. One of the means of identifying plants can be taste and in the case of Water-pepper it is not a very pleasant one; it has been described as 'biting', 'burning' 'hot-peppery when chewed', 'bitter', 'pungent'. So, perhaps it's better to rely on sight and visual observation where this plant is concerned. 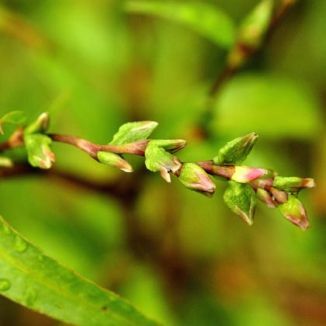 This plant was previously known as Polygonum hydropiper and Glúineach the.